Many home buyers end up being so excited at the prospect of owning their own piece of real estate that they do not have properties thoroughly inspected before signing the paperwork and closing the deal. This often results in repairs having to be done afterwards, which can cost thousands of dollars. However, scenarios like these can easily be avoided if you have a pre purchase building inspection performed beforehand. Having a pre purchase inspection performed on a house or apartment before agreeing to buy it will enable you to determine whether there are any serious structural issues that will need to be addressed. If there are, the inspector will be able to provide you with estimated costs for repair work that will need to be done before the property can pass inspection. Our inspector will check the entire property, both internally and externally which is used to compile a detailed report noting any areas of concern that need to be addressed immediately. All pre purchase inspections performed by our company are done according to Australian Standards 4349.1. Upon completion of the inspection, a fully written report will be emailed to you within 24 hours of the inspection being carried out. If you are not able to be present while the inspection is being conducted, you can call the inspector to discuss details of their findings. You will be advised what defects are present, where they are, what could happen if they are not attended to quickly and the estimated repair costs thereof. The inspector will also provide recommendations for companies or trades people who will be able to assist with the repair work. 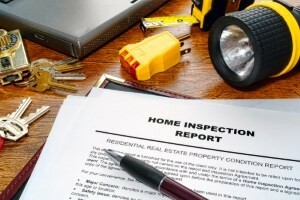 What is checked during a Pre Inspection? When a pre purchase inspection is performed, the entire property will be carefully checked over. This includes roof cavities, the outside of the roof (tiles, shingle, sheeting etc. ), under floor spaces and foundations, the external structure of the home itself (this includes walls, doors, windows, stairs, garage doors, lintels etc. ), the inside of the property (bedrooms, bathroom fixtures, electrical installations, floor coverings, kitchen, bedrooms) and so much more. Walkways, driveways, steps, surface drainage and retaining walls are carefully inspected as well. Each of these areas will be inspected for issues such as rising damp, drainage, dry rot and ventilation issues. If you are considering bidding on a home at an auction or you have put in an offer for consideration on a home through an estate agent, we recommend that a pre purchase inspection be scheduled with us today. Although it may seem like an unnecessary expense, spending a few hundred dollars on having it done could very well save you a lot of money and potential heartache along the way, especially if your initial dream home becomes nothing but a living nightmare because of previously undetected structural issues. Numerous customers who have had pre purchase inspections performed by our fully qualified and experienced builders have been completely satisfied with our services. Our inspectors have more than 20 years’ experience and are more than willing to assist you when it comes to determining whether a home is worth purchasing or not.